This is a really well laid out summary of all of the major indications to watch in the real estate market, complete with visually simple and clear charts. BuzzBuzznews does a nice job of explaining sales so it’s clear they are talking about transaction volume, and then they separately address price, which is the thing all homeowners care about. They also show how the market has shifted to lower priced properties (mostly driven by the new mortgage qualification rules) and the resulting trend toward alternatives to detached homes, such as apartments/condo’s and townhouses. 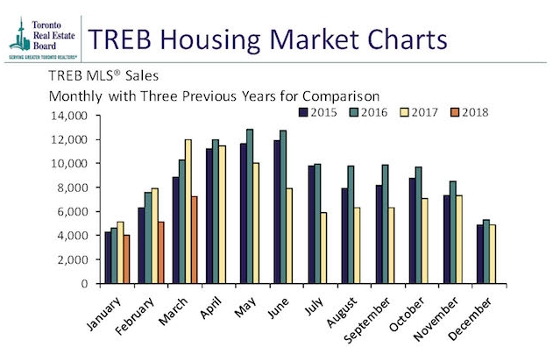 "What’s going on here: The Toronto Real Estate Board shows how home sales have varied on a month-to-month basis over the past three years.